Daniel Gray, 21, suffered severe brain injuries when he lost control of his car on a wet road in Ruislip and crashed into a tree. 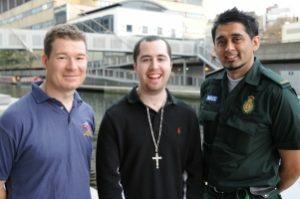 But thanks to the immediate lifesaving care by London Ambulance Service staff, the London Air Ambulance’s medical team and the specialist trauma team at St Mary’s Hospital, he is able to walk, talk and play football again only ten months after the accident. Paramedic Waseem Khan, who treated Daniel, said: “We found him lying in the middle of the road, barely conscious and with life-threatening injuries. By giving him vital on the spot treatment and taking him straight to St Mary’s Hospital, by-passing his local A&E, Daniel had the best chance of survival and smaller risk of permanent disability.